Queensland’s Tropical North is the only place in the world where two UNESCO World Heritage sites meet—the Wet Tropics rain forest and the Great Barrier Reef. This scenic flight affords incredible aerial views of both, as you soar over Port Douglas, Daintree Rainforest, Green Island, and Arlington Reef. Your tour begins with pickup from your Cairns hotel and a short transfer to Cairns Airport, where you’ll board a fixed-wing aircraft. From your window seat, enjoy spectacular aerial views as you take off over Cairns and head north along the coast to Port Douglas. Fly inland over the lush landscapes of the Daintree Rainforest and then swoop low over the islands and cays of the Great Barrier Reef, looking out for turtles, sharks, and stingrays in the crystal-clear waters below. 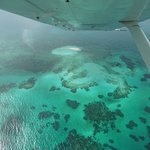 Listen as your pilot points out notable sights and landmarks, including Green Island, Double Island, and Palm Cove, and fly over the Arlington Reef, Upolu Reef, Batt Reef, and Tongue Reef. As you land back at Cairns Airport, a driver will be waiting to take you back to your hotel. It is amazing to see the Greet Barrier Reef from the sky. The tour was great as we saw Green Island, Michaelas Cay, Port Douglas, the rainforest and other beautiful places. Great Value, Safe & Clean Aircraft. Get quick answers from 60-Minute Great Barrier Reef and Port Douglas High-Wing Scenic Flight from Cairns, Including Green Island staff and past visitors.